From flowing singletrack to wide open fire roads. 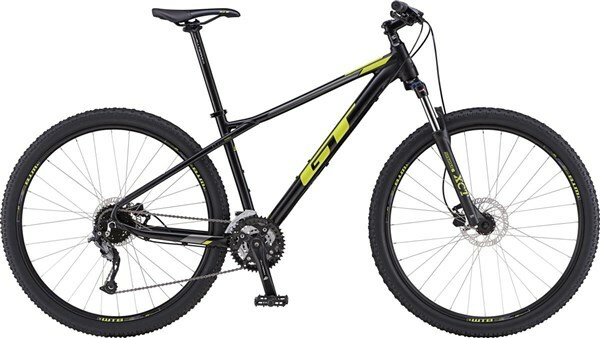 The GT Avalanche Sport is hardtail mountain bike that offers high performance characteristics at an affordable price point. The high-end 6061-T6 aluminium alloy frame has been redesigned for 2017 and features similar cross country frame geometry to the Zaskar for a stable and efficient riding position on XC trails. The triple triangle design adds rear end stiffness while the tapered head tube keeps the front-end tracking precisely. 27.5” wheels offer the ideal balance between rapid rolling and nimble handling over rough ground. The SR Suntour XCT-HLO fork offers 100mm of suspension travel to take the sting out of the trail and features a hydraulic lock out so you can ride more efficiently on smoother trails. The Shimano 3x8 speed drivetrain gives you a wide range of gears for taking on all the varied gradients on your MTB route. The hydraulic disc brakes offer confident stopping power in all weather conditions. 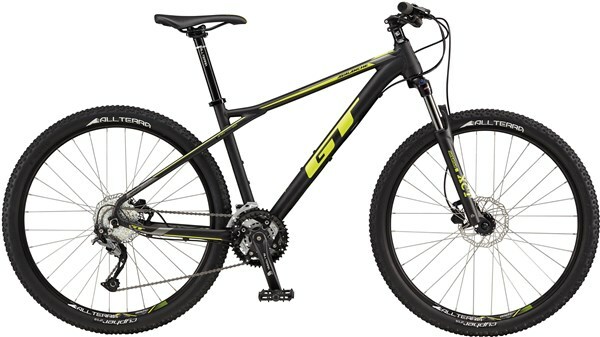 The GT Avalanche Sport is a rapid hardtail for MTB adventures. Front Tyre: All Terra Cypher 27.5X2.1"
Rear Tyre: All Terra Cypher 27.5X2.1"
First off, thanks to Tredz for some great customer service, a wonderful buying experience, and delivering the bike before the estimated date. The tools were an unexpected and thoughtful touch. As for the bike: Quality of construction, paint finish, welding and cable routing are top notch. The frame looks and feels like a piece of engineering. It's smooth, stable, nimble, quiet and much faster than my old 26". Especially on climbs. Compared to the old bike's v-brakes, the Tektro hydraulic discs are utterly monstrous: there is always more stopping power available than you will need. That's not to say you lock them up and fall off every time you so much as look at them, because they're also wonderfully predictable, progressive and full of feedback. I grew up with cantilevers; this is my first bike with hydraulics and they're a revelation. The fork is OK ...I bought the bike with the intention of upgrading to a RockShox 30 Gold. Lockout is good for climbs and smooth tarmac, but the rebound is snappy and cannot be adjusted. Tyres fitted were Kenda Slant Six. Fast at higher pressures and very grippy on dry tarmac. Front feels a bit nervous on loose dirt, and not much wet grip over stones and logs. Rims and hubs seem sturdy enough but I'm going to upgrade these too. Shifters and mechs are quick, but can be a bit sticky. Not worried by this as it's a new bike: cables are going to stretch and teeth will deburr with use. It's a solid bike, and in my opinion the best looking at this price point. Great service from Tredz too.